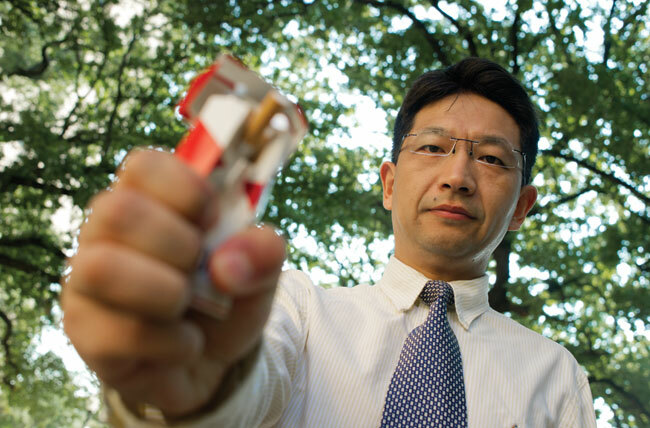 Zhiyong Yang's study challenges our ideas about parental influence on smoking. Keeping your kids away from tobacco or alcohol may not be as hard as you think. According to marketing researcher Zhiyong Yang, the best weapon is a healthy dose of posi­tive parental reinforcement. Each day about 3,900 people under the age of 18 begin smoking in the United States, according to the U.S. Centers for Disease Control. An estimated 1,000 of them will become daily cigarette smokers, with about 30 percent continuing to use tobacco to the extent that they eventually die early from a smoking-related disease. Dr. Yang, an associate pro­fessor of marketing, recently published a study in the Journal of Business Research showing that early, substantive dialogue between parents and their grade-school-age children about the ills of tobacco and alcohol use can be more powerful in shaping teen behavior than advertising, mar­keting, or peer pressure. “First, our conclusion is that parenting styles can be changed, and that’s good news for the par­ents and the teens,” explains Yang, who joined UT Arlington in 2007 and specializes in “consumer mis­behavior,” a branch of marketing that attempts to change undesir­able or risky behavior. This does not include parent­ing strategies that employ nega­tive reinforcement, such as belit­tling a teenager, threats, physical discipline, or using negative consequences if the teenager’s behavior does not meet parental expectations. “In fact, our research shows that those negative strategies, like withholding affection, can actu­ally drive a teen toward smoking,” Yang explains. The research also indicates that parents could have a positive impact on discouraging their child from using tobacco by shar­ing their own experiences. “There’s something to be said for telling a teen about how you suffered when you smoked or engaged in a bad behavior during your youth,” Yang says. His findings are counter to common perceptions that parents have little influence on children’s behavior after they enter ado­lescence. Conventional wisdom suggests that peer pressure and targeted marketing and advertis­ing are of paramount influence on teen decisions to use tobacco and alcohol or engage in other risky behaviors. Associate Professors Sahadat Hossain and Melanie Sattler transform potentially dangerous landfill gas emissions into power for 1,600 households.